Use the resources below to learn how DirectLaw can help you grow your practice online, cut costs and increase your firm’s profitability all at the same time. Also check our Knowledge Base on common questions about DirectLaw and web-enabled document automation. Click Here. 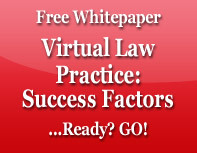 Visit our our online learning center to read more about Virtual Lawyering. Published by the eLawyering Task Force, Law Practice Management Section, American Bar Association. Digitized, semantic legal-expert systems will enable more people to access and understand the law. A Video Demonstration of the DirectLaw Virtual Law Firm Platform. See how our Rapidocs document assembly software works inside DirectLaw's platform. Try Rapidocs "live". Click here to see how online Rapidocs questionnaires work. Visit our DirectLaw Support Portal for more information and answers to frequently asked Rapidocs questions or our Knowledge Base on this web site. *Can I sell my own documents & what are my options? Use our 30-day free trial version to "take the tour" and explore how it works. The trial is not intended to be integrated with your website. Upgrade from your Free Trial to one of our subscription plans at any time.